On Thursday, Page 2 ran its list of the best hockey nicknames of all-time. We asked for your take, and you filled our mailbag with plenty of opinions. After going through more than 300 letters, below is a complete rundown of the Top 10 vote-getters, along with some of the best letters about each nickname. And be sure to vote in the poll at left to choose the all-time best hockey nickname. The name basically sums up all that he has done for the sport and for the communities that he has been involved in. He is the ultimate ambassador of hockey. My choice for the best hockey nickname is, "The Great One," Wayne Gretzky. The name says it all. He was the greatest hockey player ever, rewriting the record books. I believe those records will stand for a long time. 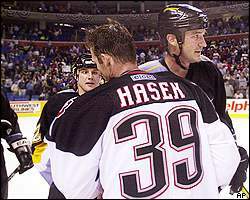 Not only has Hasek won the Hart and Vezina Trophies, but he did it in the same season. And he did it twice already. This man is amazing, he dominates games, the Sabres' defense is made even better with the Dominator in net. 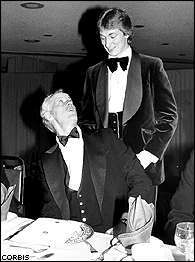 Mr. Hockey, left, and The Great One were both All-Stars in 1980. You forgot to list "The Dominator," Dominik Hasek. What a great mix of his name and the way the he plays hockey. Completely dominating between the posts. For my money, the best hockey nickname is Stu "The Grim Reaper" Grimson. While by no means a legend, he wields his stick like a scythe for good (the occasional goal) and for evil (shall we say, enforcement). And when you hear a nickname like that, you don't have to ask what sport he plays! I can't believe you left out one of the best hockey nicknames today: Stu "The Grim Reaper" Grimson. Known for his ferocious hits and less than sportsmanlike tactics on the ice. Super Mario, right, and The Dominator shake hands after battle. Note: Lemieux also received four votes for "Le Magnifique." No name could be more fitting as to just how good a hockey player he was and still is. You basically could have called him Superman, but Super Mario sounded better. His hands were literally like hammers when he dropped the gloves. His punches looked like they were breaking face bones with each connection. The most accurate nickname in sports. Pavel Bure's nickname, "The Russian Rocket," is the best nickname because it shows his nationality and his speed. With all due respect to little brother Henri, and "Russian Rocket" Pavel Bure, there is only one Rocket. From the fire in his eyes to his combination of speed, power and intensity -- the man was a human rocket. This man was able to move an entire city to riot, and the reverence he received at his passing -- from all hockey fans, but especially Quebecois, transcends the sport. 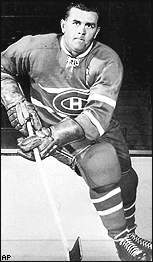 Maurice Richard, the one and only Rocket to many hockey fans. Much like Magic's moniker, with Joseph, it's almost getting to the point where you don't even call him "Curtis Joseph" anymore. Mr. Hockey. The name says it all: great player, great ambassador for the game, great in the community. Looked and played like a rat during his NHL tenure. Actually, most rats are probably more attractive.